Friday evening a storm was brewing. The wind started to pick up and the temperature was quickly dropping to frigid. The thunder was rumbling in the distance and gradually rolling in closer by the minute. I was at my laptop, watching the radar and wondering what I was going to make up for dinner. I started pursuing food blogs in search of some inspiration and I happened across Annie's Eats. 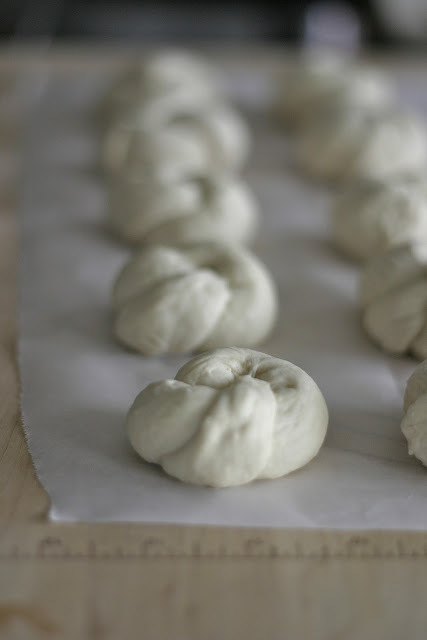 Her blog is fairly new to me and I was poking around and was suddenly inspired by her Soft Garlic Knots post. I thought to myself "Hmmm, I have some of my absolutely fabulous bread dough in the fridge that needs to be used up. I wonder...." By this time, the thunder was incredibly loud and the skies had opened up. I grabbed Natalie and we went into the kitchen and I pulled out my bread board. We rolled up our sleeves and floured up our hands and began to tear off plum size pieces of dough and started rolling it out to about 6 inches long. Tie them into a knot tucking the ends into the middle. After we tied them all up, we laid them on a cookie sheet lined with parchment paper and we let them rest for about 40 minutes. Meanwhile, preheat your oven to 350 degrees. Before you put them in the oven, melt some butter and add minced garlic and Italian seasoning. Brush on to the knots. Place them in the preheated oven for around 20 minutes. Viola! Yummy warm bits of goodness! Oh how these made me squeal with delight! I just love when something turns out so great! I served these alongside garden Rotini with butter and a splash of olive oil, grated Parmesan, salt and pepper and a sprinkle of Garlic Garlic. Yum! Great pics! Thanks again for the award! These look fabulous! Thanks for visiting my blog!